Excellent, lightweight and highly portable! The Smartscoot is a highly adaptable mobility scooter that can take on all your daily tasks. It is easy to set up and disassemble, its low weight makes it easy to put into even the smallest car trunks. High speed and distance per charge gives you a problem free ownership. When we first reviewed the SmartScoot mobility scooter we were amazed at how lightweight it was. Just by looking at it, you understand how simple and lightweight it is. A great option for those with a disability who still want to have an active lifestyle and travel around with ease. This is a very versatile scooter that fits into most categories. Hence, a great addition to our electric mobility scooter buying guide. From our own testing as well as what the common user reviews say, everything points towards the SmartScoot being the best option for most people. But it doesn’t end there, this mobility scooter seems to have it all. It has a lightweight frame which you can easily break into three sections without having to use any tools at all. The biggest part ends up weighing approximately 27 pounds making it very easy to lift, even for elderly and those with very limited arm strength. For someone with limited mobility, being able to load, unload, and set up the electric mobility scooter yourself is great. It will increase your freedom and you won’t have to depend on others to help you do the legwork. The top speed of 7 mph is almost 3 mph faster than most other mobility scooters within its price range, these are often capped at around 4-5 mph. It gives you the ability choose between three different speed modes. This gives you the option to limit the top speed depending on your requirements. So you don’t have to worry about pushing over any shelves in the store just because you accidentally hit the throttle while grabbing some groceries. Recharging is as easy as plugging it in and waiting 3-5 hours depending how much juice you had left. It’s recommended to only charge the battery once it falls below 50% in order to extend the battery life. 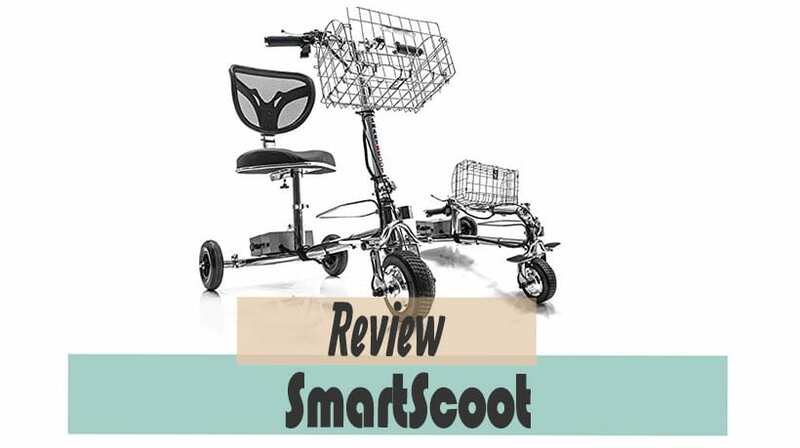 The SmartScoot has 3-wheels and uses a front-wheel drive system which gives you superior stability due to the fact that the front-wheel drive pulls your weight instead of pushing it, eliminating all possibilities for popping an incidental wheelie. The rear-wheel drive scooters in the other hand might give you slightly better grip but we always vouch for stability here and front-wheel drive are superior to rear drive in terms of stability. Its turning radius is about the size of the scooter and you will have no problem going through narrow places. It has a lot of smart features like being able to adjust the width of the rear wheels in order to provide maximum stability. The only thing it doesn’t do is support people above the 250lbs, people looking for a great heavy-duty mobility scooter should check out our top recommendations here. This feature also lets you get through most narrow doors where other mobility scooters might not fit. Great thing to be able to adjust when using it at home, indoors. It’s 40-pound weight and easy assembly makes it great for disabled people who might not be able to lift as heavy. Traveling with a mobility scooter couldn’t be easier. Compact size when folded and the ability to split it up into two pieces with the heaviest part being 27 pounds and the lightest part 13 pounds. Its lithium-ion battery complies with the UN PT. III 38.3 requirements and most airline personnel are familiar with the assembly/disassembly of the SmartScoot. Many people suffering from MS loves the SmartScoot and it helps them get a bit more mobile when MS-fatigue kicks in. Many users found that this mobility scooter has given them their life back in terms of being able to get around by themselves, they can load/unload and set it up all by themselves. Also, don’t forget to check out the automatic folding scooter EV-rider transport review. EV-Rider TranSport Review - How good is it in comparison to others?